I went to Perth recently, and stayed with my parents and my sister out in the Swan Valley. The day I arrived, really casually, as if it might not be that interesting to me, my mother mentioned that there was a vegetarian restaurant just down the highway from their house. I love the Swan Valley, especially how I get to stuff my face with grapes and watermelon picked that day, and its proximity to the Junction Icecreamery, and the six (six!) op shops in Midland, but when it comes to vegetarian food it is not that great, so I was very interested in a vegetarian restaurant close by. They only do dinner once a week at the moment, though they do lunch and breakfast a few other days, so my mum made a booking for Friday dinner and off we went. 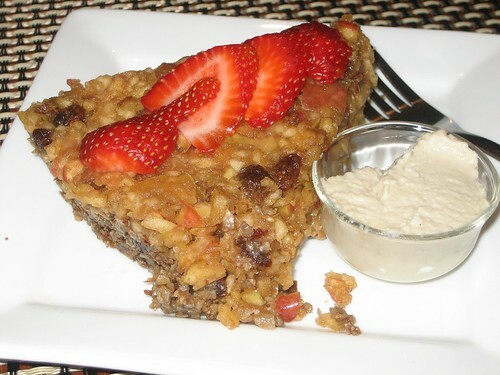 As I was perusing the menu, there were many things that I wasn't sure would be vegan, things that sounded cheesey, like the lasagna and the pot pie. But every time I asked, the answer was that it was vegan tonight. Upon closer questioning, it was revealed that, because when my mum had booked, she'd said 'and my daughter is vegan,' all the stuff they'd usually make with dairy cheese they'd made with a combination of vegan cheese and nutritional yeast, so just about everything on the menu was vegan especially for me. Which was a little bit exciting. We leaped straight into the dips. The dips were amazing! The dips are made on the premises; there was a spinach dip, a capsicum dip, and a hummous, as well as some dukkah (which, side note, I think I had more dukkah in this quick Perth trip than I have in the whole twelve months previous). 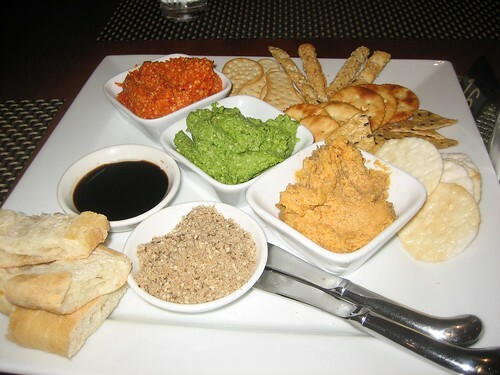 If you look closely at the platter, you'll see a few different types of crackers on there, some of which aren't vegan. I was really happy with the service and attentiveness that we received at Swan Valley Cafe, but for vegans I do think a bit of self-aware caution might stand. They're new to dealing with vegans, so there are a few 'wait, how is this not vegan?' issues that need to be ironed out. But when I pointed it out they were really good about it. I went for the lasagna. Of course I did. 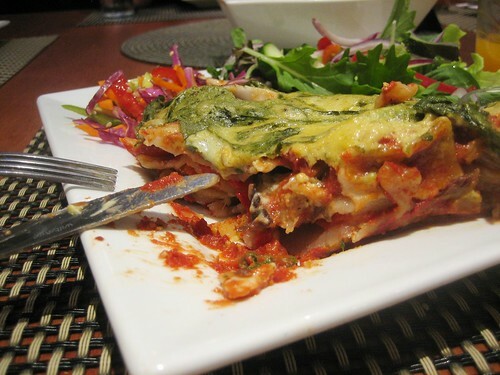 This was delicious, filled with sun-dried tomatoes and roasted capsicum and an assortment of other vegetables, covered in a nutritional yeast and vegan cheeze sauce (I think this was creamy sheese). It was served with a garden salad with the dressing on the side (yessss) and a little salad with sesame oil dressing, featuring cabbage and carrots. Other mains eaten (the photos were a bit blurry town) included the pot pie which smelled amazing, and which my sister was super delighted to have ordered; a Mediterranean vegetables and cous cous dish, which my mum ate all up; and a light but tasty yellow curry for my father. For dessert, Julie went for the summer apple pie served with cashew cream. In truth this was less pie and more raw cake, but it was delicious, with lots of nuts and dried fruits and a really great fresh apple flavour. I went for the chocolate mousse, which was massive and had a hint of strawberry floating through it. It was delicious, but I wasn't able to finish it. The grounds of Swan Valley Cafe are really delightful, and I bet it makes a lovely brunch venue. Out the back is a little plant nursery, selling a combination of natives and exotics, and offering a great view across to the river. The service was good, but as we were the only people there the fact that the sound system was insufficient was quite noticeable, I felt awkward making noise. I'd like the chef to be a little more cautious checking the non-veganness of store-bought products, but I have no complaints with food that they made on the premises, and I will almost certainly visit next time I'm in the area, if they're still around. It is in the Swan Valley, after all, and although there are many well-known restaurants out there, I wonder how much through traffic they'll get. I love Perth, but my recent trip has just reminded me how much people expect meat when they sit down at their meal. The first of my CNY events was going to Veggie Kitchen: Intention of Love with Cindy and Michael, K and Toby, The Veganator, and Bec who has no blog. K took the initiative and organised this CNY dinner, and I'm glad she did because a) CNY events are the greatest events, and b) it was delicious. 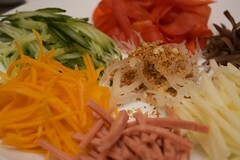 During CNY Veggie Kitchen is offering a special CNY banquet for $28 a head. We made the executive decision (before every one had arrived, even!) to go for the banquet, and Toby and I made the decision to also order a side of siu mai, because it's delicious and it was on the menu and how could we resist? The banquet included two types of drinks. 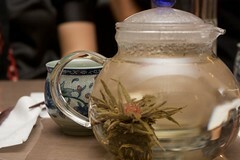 We were constantly being plied with some Taiwanese blossoming tea, or as I like to call it, monster tea. I love watching it unfurl. It takes quite a while to infuse though, so don't be in a hurry to drink it! We also received these tiny glasses of apple sprout soy milk, which I have to say was the most delicious soy milk I've ever drunk ever. It was amazing. I would drink more of this if I could. 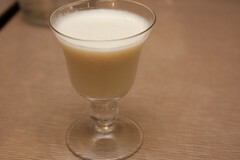 It had this very soft sweetness underneath the usual soy milk flavour, really subtle but really delicious. 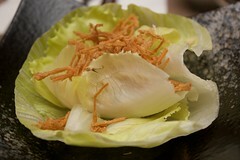 Next up was some lettuce delight (looking suspiciously san choy baoish), followed by the yee sang. The lettuce delight was super crisp and really delicious; the lettuce was filled with a mixture of nuts and mock meat floss and the textures were great. The yee sang was okay, it included apple, the flavour of which I found really over powering, and I didn't really enjoy the mock ham. It was also served with carrot, capsicum, cucumber, mushrooms and what Toby thought was konjac. There was no crunchy, which I missed, and I didn't really like the sauce. Sad! I didn't take any great pictures of the next course, which was deep fried deliciousness, spring rolls and tofu. The tofu was much coarser and thicker than I expected, kind of like a hard sponge which was surprising but worked really well. 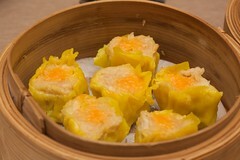 The siu mai was freshly steamed and delicious in the way of siu mai. 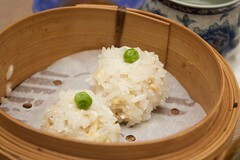 The pearl balls contained tofu and mushrooms for filling. I've really come to like pearl balls, though I'd never eaten them before last year. Last CNY, Johanna brought pearl balls to my CNY party, and they were new to all of us, and yet here they were at our CNY banquet! 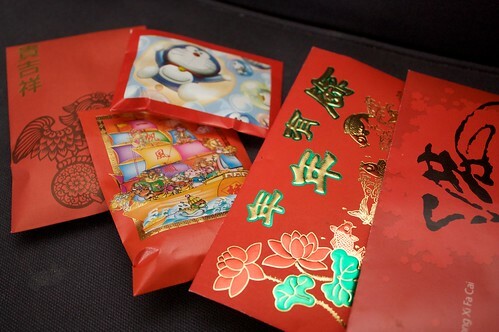 I'm deducing that they're a Taiwanese CNY variation. Almost to the end, we had this amazing vegetable huo guo thing. It might have been a five elements sort of dish. This was filled with an assortment of vegetables that had taken on an incredibly delicious flavour and had softened so completely. 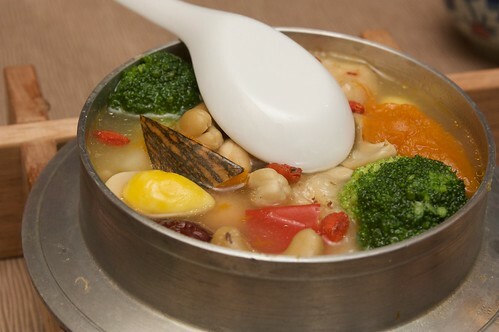 The soup included pumpkin, broccoli, tofu, cashews, mock meat and some mushrooms. The flavours of this dish were just amazing, I don't know why but they were not overpowering and worked really well together. We rounded the meal out with cha siu on forbidden rice (which was very dry, so I poured some of the soup from the previous course in to it) and then tang yuan and ice cream for dessert. The ice cream was served with this homemade strawberry jam which was pretty amazing, and the tang yuan, soft and chewy as it always is, had a crumbed (but gluten-free) exterior which made it unusual to chew. I really struggled to finish dessert though, as I was just so full. This meal was amazing. There's still a week of CNY left, I totally recommend dropping in and trying it out. K has blogged about it already, completely gluten free. And just as varied and delicious! Pets were not allowed in the cyclone evacuation centres, while farm animals were in paddocks when Yasi hit. RSPCA spokesman Michael Beatty says there have been plenty of bird deaths as well as reports of animals wandering the streets. Cassowaries are getting help after the cyclone! Sled dogs massacred after Canada Winter Olympics - business dropped off after the Olympics, so the huskies that were brought up specifically for the Olympics were then killed. In other 'why are humans so crappy' news: Cockfighting bird stabs California man, Jose Luis Ochoa, to death: police. Specifically, cockfighting: why do it? Back in Australia, an article on the ABC where the risks for jumps jockeys are identified. So if when you're arguing against jumps you find that people don't care about the horses, try this argument instead. An op ed at the Herald Sun on a new proposal around disposal of young calves. At the state's largest wind farm at Woolnorth in the island's north-west, 19 wedge-tailed eagles are known to have been killed since it began operations in 2003. Another three sea eagles also have hit the rotors. At Vegans of Color: How NOT to Inspire More People to Go Vegan, on an awareness graphic. The Face of Exploitation by s.e. smith at This Ain't Livin', on the human exploitation elements of food (both animal and vegetable). I link to Treehugger way too much, but: Chinese Activists Call Canada Racist For Selling Seal Meat because Canada has sold seal meat to China (perhaps) on the assumption that those Chinese will eat anything. This is not vego-specific (though our catastrophe's addition at the end is), but how to shop when you are poor is a good post. at the smh: Wasteland: the $7.8b of food Aussies throw away . I failed to post about this before call for papers closed, but the 4th Annual Australian Animal Studies Group Conference is being held 10 - 13 July at Griffith Uni in Brisbane. Potluck #1 is up! Announcement for #2 is coming soon. Ages and ages ago Em blogged about this quinoa avocado salad, and I promptly forgot about it until Michael also blogged about it. I totally slacked off, using lemon juice (from a bottle!) instead of lemons with their zest, and I skipped the coriander and increased the amount of sultanas slightly. I also neglected to toast the sesame seeds, because I was trying to keep my dishes down. 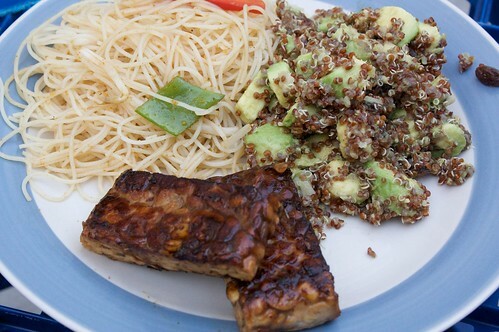 I served this with some tempeh (over-marinated, I'm sad to report) and a curry-ish noodle salad (inspired by Gen at FoE, but unlike hers mine was a complete failure). I've never made quiche before, and this was my first attempt. It was amazing. Try it - you won't regret it. Grease a tray, and line it with baking paper. The tray I used was square and about 20x20cm. Press the puff pastry in to the tray, prick it with a fork once or twice, and in a preheated oven bake for 10 minutes at 220C. Beat together the flour, water, oil, nutritional yeast and dried basil, as well as a little salt and pepper if that takes your fancy. Pour a little bit of this mix in to bottom of the puff pastry. Throw in (or layer in, as it takes your fancy) some of the onion and tomato, then pour in the rest of the batter. 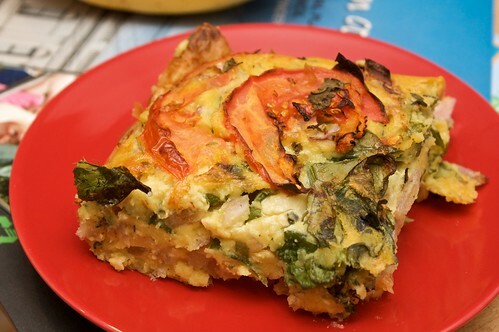 Set out the remaining onion and tomato on top, as well as the fresh basil leaves. If you have any vegan parmesan, sprinkle this on the top. Bake for about 40 minutes, until it's golden and quiche-like. I've been getting heaps of spam lately, so I'm going to be moderating all comments on here for a little while. This makes me sad! But hopefully I'll do some other stuff too, and it will cut down on my epic spam. 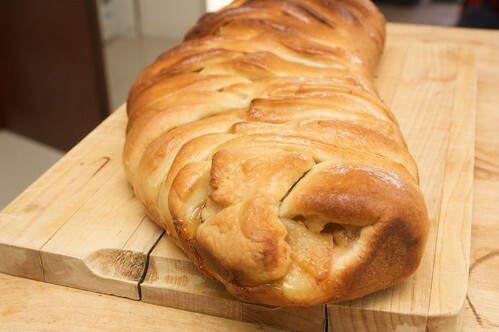 I have been thinking about this apricot and apple braid ever since I first stumbled across it, and during a cooler day I managed to finally buy some apricot jam and give it a go. I've never made anything like this before. It was a little bit fiddly but once I got used to working with the dough it all sort of fell in to place, and became a lot of fun. The braiding is cheating, I'm not sure if the way I did it is the way it is supposed to be done. The dough didn't rise as much as I had hoped it would whilst it was proofing, but it all still turned out okay in the end, and didn't stop the braid from being delicious. I used dry yeast, and next time I do this I will activate it separately in a little warm water before mixing it through, in the hopes that it will work a bit better. This has made me realise how much work my rolling pin skills require. To make the dough, mix flour, sugar, salt and yeast (for reference, in future I will mix the yeast with a little sugar and some warm water separately and ten minutes in advance, before progressing with this step). Combine the melted nuttelex with the soy milk and the apple sauce. Then knead it all together! Knead it for at least ten or fifteen minutes, before covering it and putting it in the fridge for the day or over night. To make the filling (the next day ish), start by soaking the sultanas in a little hot water whilst you prep the apples. 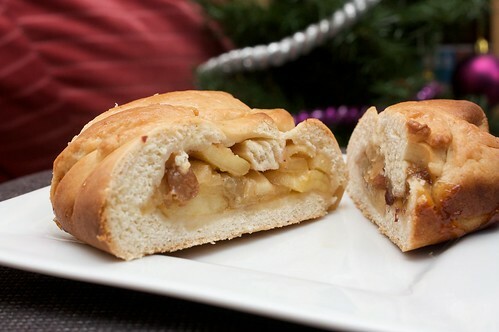 Then in a sauce pan melt the nuttelex and throw in the apples with the brown sugar and the cinnamon. After the apples have softened, add the sultanas (drained) and the lemon juice. Smush it all together, then set aside to cool. Hopefully the dough has risen! Punch it down and knead it some more on a floured surface. Roll it out until it's a giant rectangle, and quite thin (as in, height-wise, not width-wise). Image it divided in to three long thin rectangles, and then cut two centimetre strips in to the two outside rectangles, towards the centre. Check out the pictures in the post at My Kitchen Snippits if you're confused about what I'm describing. Across the middle, spread all the jam. 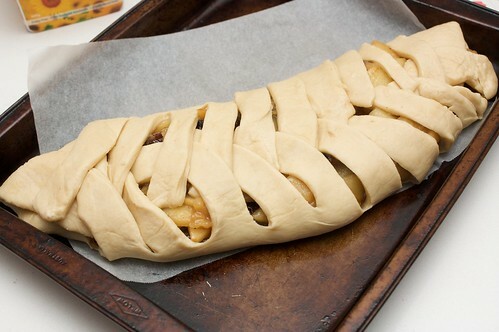 Put the apple mixture over the top of this, and make sure it's all evenly distributed. From one end, fold in alternating sides so it looks sort of like a plait. Fold at an angle. Plait them as close together as you can - leave too big a gap and the delicious juices run out and cover the bottom of the baking tray and gets all sticky every where. Seal the ends, and leave (covered) to rise for about half an hour to an hour. Preheat the oven to 175C, glaze the braid with the soy milk + apple sauce combination (just mix the two together well before brushing on), and bake for about half an hour. On fan-forced I only required just under 25 minutes for it to be golden coloured. 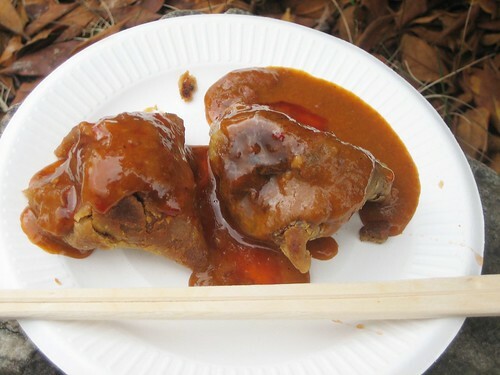 I had a lot of fun in Japan, and I had a lot of fun eating, but the eating in Japan was not without its difficulties. I can read katakana and hiragana, and I can guess at the meaning of kanji based on my ability to read Chinese hanzi, so sometimes menus in restaurants (or picking items off shelves) was half of a guessing game, half of a hoping that I'd read it correctly. This meant needing some back ups for times when I wasn't sure what was going on. My very favourite back up was konbu onigiri / こんぶおにぎり. I developed this obsession with 711s in Japan not only because it was the only place I could reliably withdraw cash, but because rather than the food being fatty and unhealthy like you'd get in Australia, the convenience food (handily, found at the conbini) were bento boxes and onigiri. I love onigiri. With the konbu onigiri there's a slight chance of it containing katsuo bushi, but Anna assured me it was my ever present foe and to continue on regardless. I managed to get my hands on some baked goods at various points. I found der Akkord in Minato-ku, a totally vegan bakery. From there I supplied myself for the trip home with chocolate mousse, some apple pie, and some flavoured breads. Some of the breads were sour-dough-y, which was a bit off putting, but the mousse and the curry filled breads I had were delicous, and made nice snacks on the flight home. In addition, I was delighted to discover they had a folder, in both English and Japanese, with a full list of all ingredients in all products. In Minowa, I found Cafe Mugiwarai, a tiny vegetarian bakery where I picked up a sultana-filled bread stick to supplement one of my many rides on the shinkansen. Nobody there spoke English but we got by okay. I became obsessed with edamame whilst I was in Japan. Conveniently it is available everywhere, including ready to eat at supermarkets (but made more delicious by a quick dousing in water hot from the kettle, and the liberal application of salt). Plain tofu was also easy to find, and often I would use my hostel kitchen to whip up a quick tofu scramble for breakfast. We frequented quite a few shrine and temple market areas, and especially during celebration-y times (such as New Year, when we were there) the stalls will include grilled corn on the cob, basted in plain soy sauce (all the stalls I ate from only used plain soy sauce, though perhaps others used something different). I had not realised until this point how delicious corn + soy sauce could be. I was able to pick up some other food from floating around the temple markets. There were some snacks and things which were fine, but which I was too full to eat; and in Kyoto I found samosas that were drowned in curry before being given to me. This, incidentally, is a delicious way to serve samosas. And they were pre cut, solving the problem Fi mentioned just the other day. I suffered some cravings for ice cream, which I sated with frozen fruits, available from the ice cream chests in various conbini. I would recommend not trusting things just because they look okay. I grabbed some noodles which looked okay, but buried under the noodles and the cabbage were the tiniest shrimps I've ever seen, which was incredibly disappointing. Also disappointing was the meal that came out sprinkled with prawn flakes on the top, waving in the breeze. At one point, desperate to eat, I resorted to ducking in to a Chinese restaurant that had a television out the front playing Theresa Teng from its speakers, hoping that someone in there spoke Mandarin (they did). Here I was able to eat some vegetables, which were often thin on the ground, it being winter in Japan. If you're looking for vegan noms around Japan, I super strongly suggest doing some research. Maybe I'd have fared better if my Japanese was greater than a stilted "肉のたべません….わたしわベジタリアんです...", but the research that I did was quite helpful. Don't trust Happy Cow unless you have a back up plan. Happy Cow worked for me only once (leading me to Otis! ); otherwise I was often unable to find places. 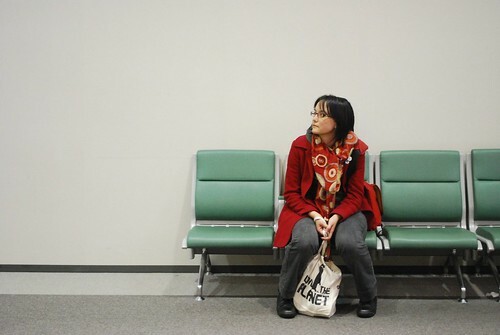 I found Cindy and Michael's posts from their 2010 visit to Japan quite useful. I even used it for non-eating things (I took their lead and did the iPod walking tour of Kabukicho and visited the Mori Art Museum, both of which were excellent experiences). Vegetarians in Japan was a good reference point, though one that I ultimately did not end up using. A lot of people have heard of Wandering Vegans in Japan, who in 2010 moved back to Australia, but their list of vegan restaurants in Japan is worth checking out. Survival Guide for Vegetarians (not only) in Japan is also a fairly good site with lots of links and ideas. Lisa lent me her 2008 version of the Japan Vegan Restaurant Pocketguide which, even though it was arguably out of date was still very useful, as it contained maps and directions. Lisa's Japan tag was also a handy resource.